MASHD graphically displays the Memory and CPU usage of your Linux based web server using existing PHP and Linux tools without root access or additional configuration. MASHD is a single PHP file that can run on any Linux based VPS or Dedicated web server that supports PHP and the exec() function. The zip file includes a tester script, if you wish to confirm that it will work with your website before ‘installing’ MASHD. MASHD is a simple page layout that has a liquid CSS design, allowing wide viewing or narrow viewing, depending on your preference. It also will display well on mobile devices (may want to turn it horizontally). If you have questions, contact me. If you like it and use it, consider helping me out with my VPS bill by making a donation through Dreamhost. Contains everything found on this page. Simple file to see if your web server will support MASHD. Should display two arrays, with no errors. 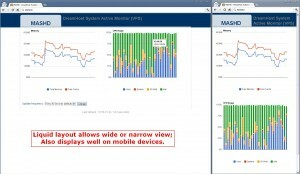 MASHD is an active monitoring program, in that it will only work when the webpage is open. 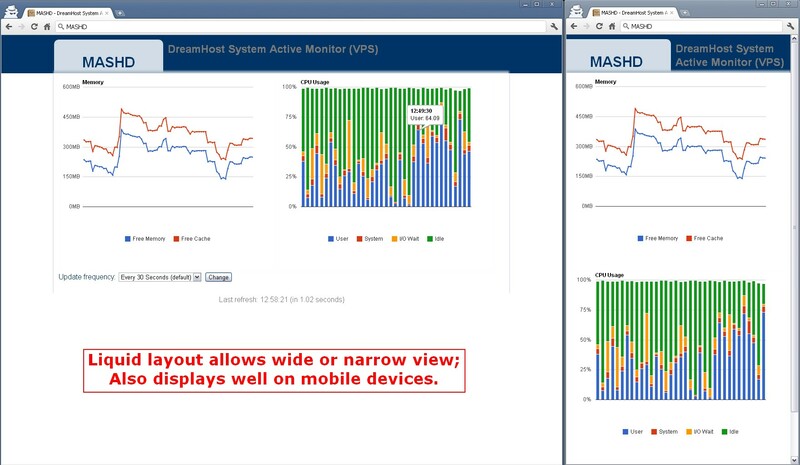 The name is the inverse acronym of the descriptive title: DreamHost System Active Monitor. It was originally designed for use on a Dreamhost VPS, but is flexible enough for any Linux based system that allows the PHP function exec() to be used. If you wish test your system, FTP mashd-tester.php to your web server and access it via web browser. It should return two arrays of data, without errors. If so, you can use MASHD. To install MASHD, FTP mashd.php over to your web server and access it via web browser. That’s it. When you access mashd.php, it will automatically create mashd_process.php, which in turn will also create mashd_history_cpu.txt and mashd_history_mem.txt files. MASHD itself uses jQuery and the Google Charts API to generate the visual results, all loaded and hosted by Google (read: very fast). There is no daily limit to calls to this service per day (< 250,000/day). Dreamhost VPS Root Access System Monitoring. Pretty awesome monitoring script. I’m going to try and figure out how to embed it on the civic wiki I’m monitoring. Thanks!